This summer, DNR staff will continue to do introductions of three natural enemy wasps that attack emerald ash borer: Tetrastichus planipennisi, Spathius galinae and Oobius agrili. The Tetrastichus and Spathius wasps attack EAB larvae beneath the bark, and the Oobius wasps attack EAB eggs on the bark surface. The tiny wasps do not sting or bite, and the public is unlikely to know they are present. These introductions are being done to help delay tree mortality and help ash trees fight off EAB in the future by lowering EAB population levels. Several thousand wasps are released at each of the sites. The wasps have previously been released in southeast, northeast and western Wisconsin. Tetrastichus planipennisi, a larval parasitoid, was successfully recovered by DNR staff at three sites in Milwaukee, Ozaukee and Washington counties in May 2017. These are the first recoveries of this wasp from Milwaukee and Washington counties. These recoveries indicate that the wasps released in 2014 successfully established and have been attacking EAB larvae since then. 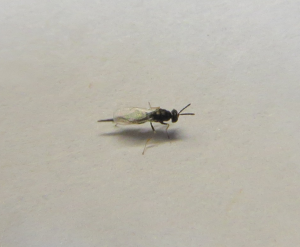 The T. planipennisi wasps have previously been recovered from sites in Kenosha, Ozaukee, Racine and Walworth counties. Tree bark samples are currently being incubated to see if any O. agrili emerge from parasitized EAB eggs. Recovery surveys will continue to be done at many locations 2-3 years after wasps are released at a site. Written by: Bill McNee, Forest Health Specialist, Plymouth (Bill.McNee@Wisconsin.gov, 920-893-8543).